I think this is quite possibly the coolest looking kitty. Three kitties mashed into one. 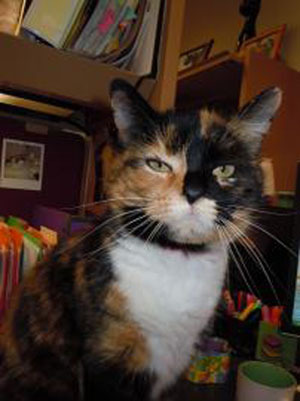 Caramel is a two-year-old female calico cat. Her coat is a striking patchwork of orange, black and white that reminds you of a Harlequin mask. Caramel was brought to the Lollypop Farm in January because of allergies in her previous home. This pretty kitty gets along with dogs and kids, but doesn't like to share her time or space with other cats. She is a bit frustrated with shelter life, and is currently enjoying office life here at Lollypop Farm. Caramel is anxious to find her forever home! Do you have room in your home and heart for this sweetie? Come meet her today...she may be your next Harlequin in fur! Granite, the dog from last week, is still waiting to be adopted.